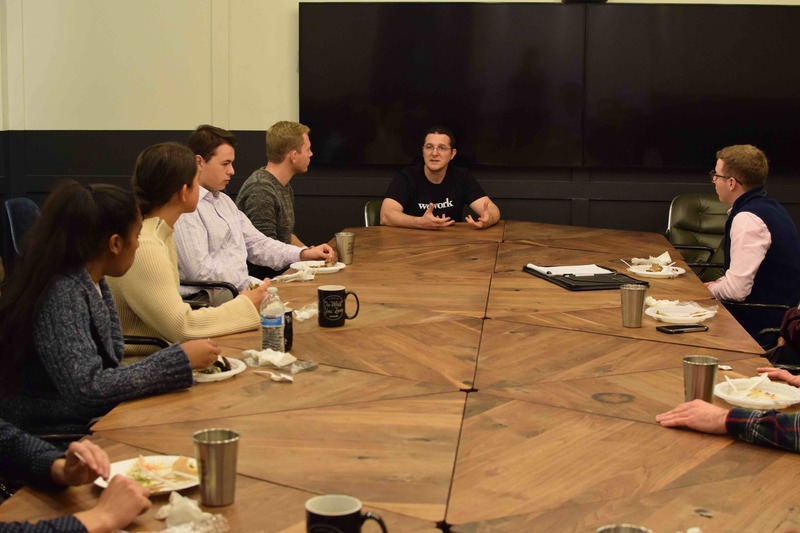 TAMID Group at Rutgers recently had the opportunity to tour WeWork headquarters in Chelsea, New York City, New York. WeWork is a company that specializes in transforming conventional and unconventional spaces, alike, into collaborative co-working environments which sponsor creativity through their unique design. Companies spanning from one to thousands of employees can subscribe to We-memberships that include access to various types of workspaces, all housing exceptional amenities. WeWork’s ultimate mission is to inspire individuals to work to build a complete life, going against the grain of working to meet a vague bottom line. WeWork was founded in 2010 and has already reached a valuation of 20 billion dollars, attaining true ‘unicorn’ status. Adam Neumann, founder and CEO, is an Israeli immigrant who lived part of his life on a Kibbutz, which gave him inspiration for founding WeWork. He has stated that the idea of a sharing economy was sourced from this life experience. The Rutgers chapter was greeted by a community department leader who ushered us through their appropriately self-titled ‘galactic’ headquarters. We ventured through different office set ups and we inquired about their productivity rates. WeWork employs internal teams to facilitate all interior design and conduct necessary research about employee output. They found that their designs, while seemingly fit with many potential distractions, spur more innovation and creativity due to the open communication of team members who would normally be segregated by department. After this, three representatives from the all-inclusive digital department, including former chief product officer Roee Adler who now oversees the digital department, spoke with us about their roles in the company. Roee discussed how WeWork is a tech firm disguised as a real-estate company. On the surface, the New York marvel owns a lot of land all over the world and is constantly expanding their ranks, acquiring more buildings for their portfolio every few weeks. Their most renowned procurement is the flagship Lord and Taylor store, a landmark in the city that never sleeps. With such a unique brand that derives its creative and colorful image from a technical foundation, WeWork spearheaded the emergence of an entirely new industry. Their success is in their ability to solve business problems that no other company has had to face, even one so unprecedented as chaotic food delivery mechanics. With so many different associates of different companies in one central location, the sheer volume of delivery orders is substantial and the confusion at the front desk follows suit as an incredible waste of time and productive efficiency for the firm. Members of the digital department engaged us in their approaches to such problems, taking us through the difficulties of developing and progressing a startup through interactive, insightful open discussions. Our WeWork excursion was an eye-opening introduction to the idea of a vibrant, fun, and efficient style of work. We hope to further engage our interests in the company through the numerous opportunities WeWork offers to undergraduates, including mentorship and internship opportunities. We are drawn to the tenacious and resilient spirit WeWork embodies so fervently in every aspect of their work. Their emphasis on the passion and variability which is so intrinsic to startup culture reminds us that a profession should have purpose beyond a source of income or a title. We hope to employ some of their methods in our chapter at Rutgers.